This Department of the Army Training Circular (TC) is dedicated to the men and women of the U.S. Army NCO Corps, who have made the ultimate sacrifice and to NCOs presently serving in the Active Army, the Army National Guard, and the Army Reserve. Your Soldiers will seek your guidance; trust you to train them, and to develop them to win the nation’s wars. As the standard-bearer, instill pride and strive to live the Army Values. Scope. This TC provides the Army's NCOs a guide for leading, supervising, and caring for Soldiers. 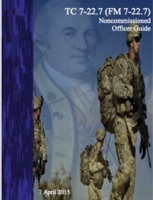 While this guide is not all-inclusive, nor is it intended as a stand-alone document, it provides NCOs a quick and ready reference to refresh and develop leadership traits. Applicability. This TC provides critical information for the success of today's NCO and is intended for use by all the NCOs in the Active Army Component, the Army National Guard, and the Army Reserve Component.